Informtainment.com by ORLANDO: Verse iTal: Makes his move!! Verse iTal: Makes his move!! Born Stefan Wilson in the seaside village of Carenage, Trinidad in 1982 his name explains his style... versatile. Managing a career in analysis and logic with a passion for lyrical creativity, this current math teacher and singer/songwriter continues to challenge himself musically ever since he wrote his first rhymes at the age of ten. Growing up, Verse was exposed to quite a wide range of musical geniuses; from the sweet melodies of Lord Kitchener, to pop legends like Michael Jackson. He truly reveres the work of Bob Marley, Buju Banton, Junior Gong and Spragga Benz who have all strongly influenced his musical style. Blending the urban vibe of hip-hop with the soothing feel of reggae, Verse spreads his positive message in an upbeat mix of tracks in his first album “Love Cry”, which promises to deliver on jams that could pump the adrenalin of partygoers as well as more soulful tracks that could induce the mellowest of moods. 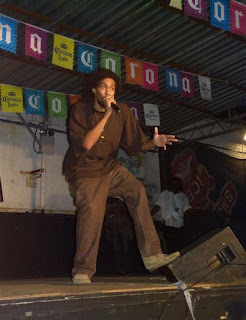 In 2000 Verse iTal left his home on an academic scholarship to attend TempleUniversity, where graduated with an honours degree in Actuarial Science. It was there in Philadelphia, the rap Mecca, that Verse rediscovered his love for writing music and for freestyle performing. There he joined a group of his peers called the Kallai Corporation. Verse’s dorm room became their amateur recording studio, belting out original compositions that they would perform at Campus and local events. Verse’s energetic enthusiasm was released, and he knew with growing certainty that music would be his priority when he returned home in 2005. It was also there in Philly after many months of spiritual searching that Verse decided to embrace the Rastafarian faith, a decision that continues to fulfill him and deeply influences his consciousness as is expressed in several of his recordings. The thematic variety in Verse’s songs reflects the complexity of his views and reflections on life. He has a deep-seated desire to increase the public’s awareness and response to issues of human injustice as in his politically influenced and stinging compositions “Love Cry” and “Jah Puzzle”. The more light-hearted side of the artist celebrates love and life, giving us witty songs such as “Nyquil “ and “Mr. Officer”. The diversity doesn’t end here; his first album also offers a touching ode to his mother simply called “Foh Mama”. Now making waves in his home in Trinidad, Verse iTal is destined to become one of this generation’s finest.